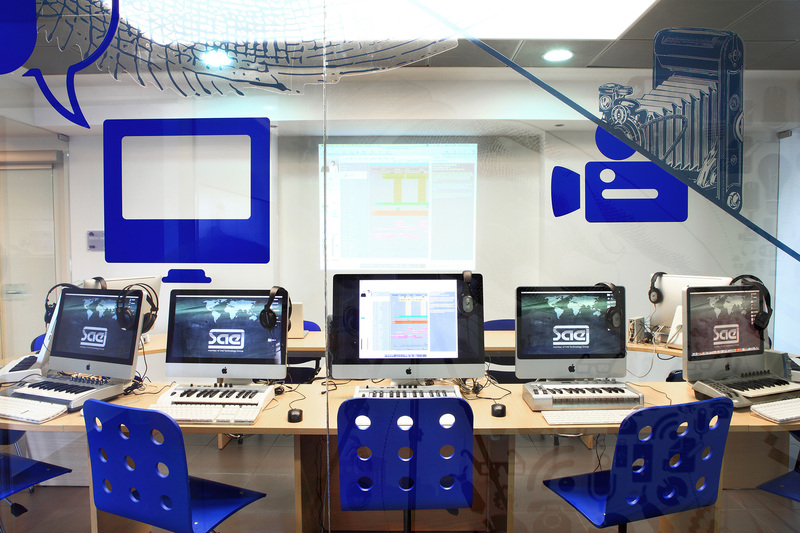 SAE Institute Athens has relocated to new state-of-the-art facilities, launching a new era of Creative media education in Greece. 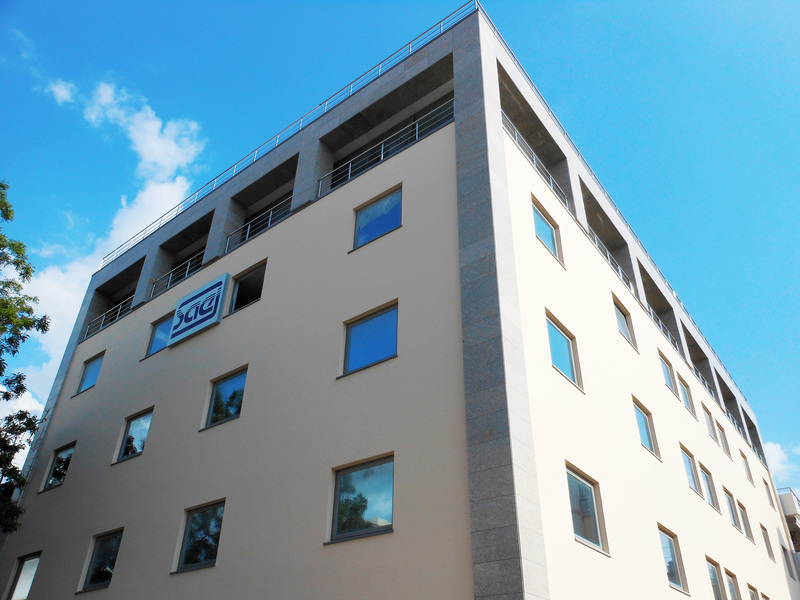 The new SAE Athens campus is located only a few minutes away from the seaside and central Athens as well. The new facilities are set to provide an excellent education environment and a high quality studying experience, meeting all industry standards. One is thing is for sure. The making of the new SAE Institute Athens is definitely a great story to tell. A story that reminds us of the ancient Greek myths with legendary heroes, tremendous villains, great achievements and happy endings (at least most of the time). The new SAE Athens campus is housed on the 3rd and 4th floors of a brand new building, owned by the Melas Foundation, in the area of Moschato (two minutes walk from the city train station), featuring premises that cover over 1000 square meters, as well as a private parking space and a roof garden on the 5th floor overlooking Athens rooftops, and a spectacular view from the Acropolis to the sea. SAE is committed to pursuing the highest level of creative media education. Therefore, the new facilities were designed and constructed with the latest technology and a progressive orientation, providing functionality in all working aspects and a contemporary form. The level of accessibility to all areas and the see-through glass walls contribute in achieving interaction and communication effectiveness among all students and staff. 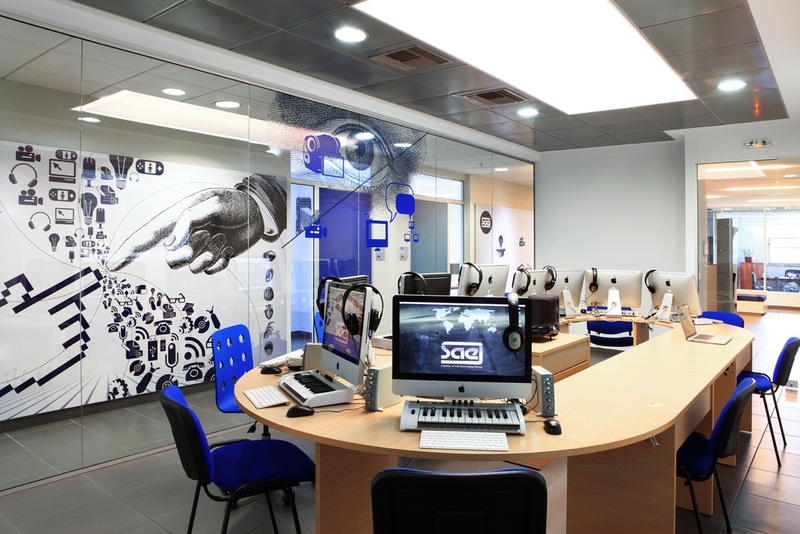 At the same time, the innovative architectural style and the graphic design already consist of the new SAE Athens trademarks, creating a unique “space-look”, while inspiring the creativity of our students. Level 1 (on the 3rd floor) has been given the code name ʻThe Planetʼ. A study area that includes classrooms, workstations and teaching staff facilities. When entering ʻThe Planetʼ, the quote on the reception’s main wall sets the tone: “Let each man exercise the art he knows” (Aristophanes). The reception is spacious and comfortable, with staff members readily available to assist every guest. 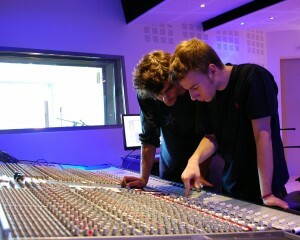 The first part of your tour on Level 1 consists of four classrooms and the working area with: student administration, lecturers, student liaison and marketing. All classrooms are equipped with audiovisual technology, while Class 1, 2 and 3 are divided by portable wall sections and can be easily transformed to one major lecture area with a capacity for 100 people – or a medium one for 50, hosting seminars and events (the first major event hosted at the new SAE Athens, was a mastering seminar, with audio guru, Bob Katz). 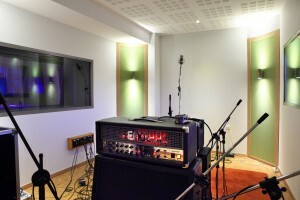 Class 4 is a “box in box”, floating construction, in order to host the “loudest” lectures. 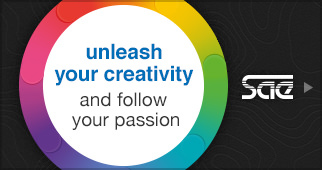 The second part of Level 1 reveals the Creative Media side of the moon. 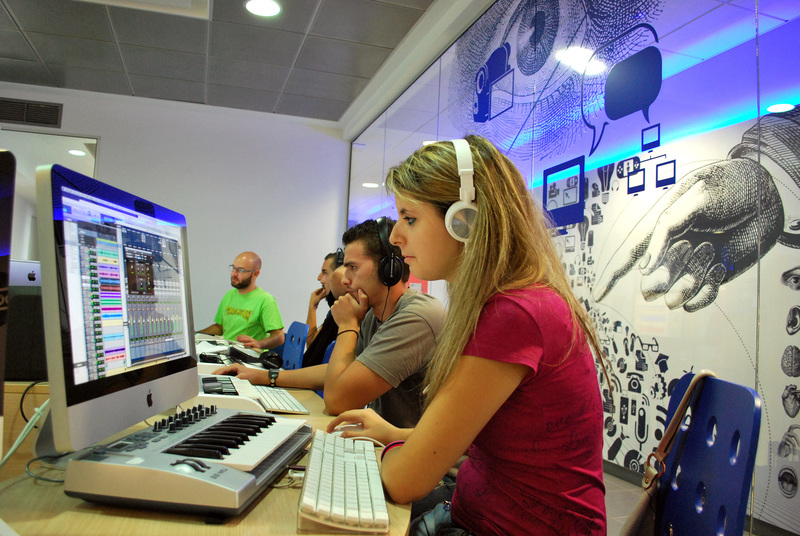 Technically advanced workstations are waiting for the students and their projects, across each and every creative media field (Audio/Film/3D Animation/Games/Web). 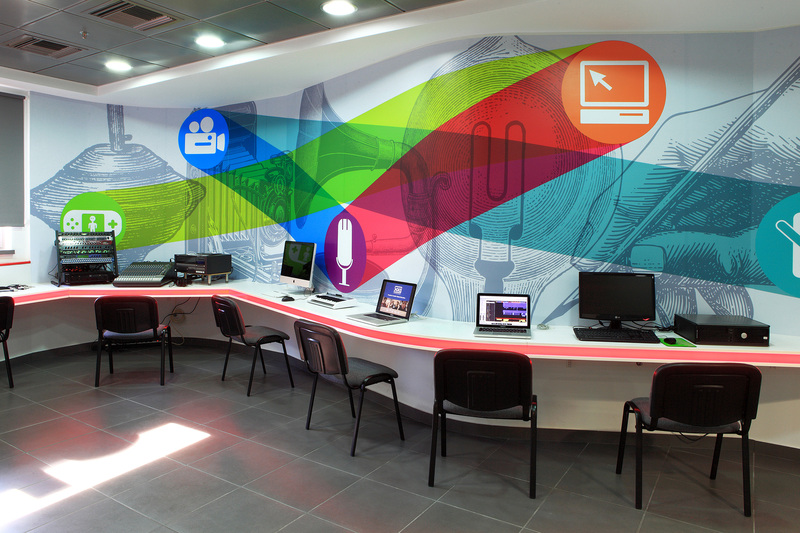 The digital workstations are located in three working areas: the Digital Lab (where practical lectures take place), the creative media area and the suites (Audio/Film/3D Animation). 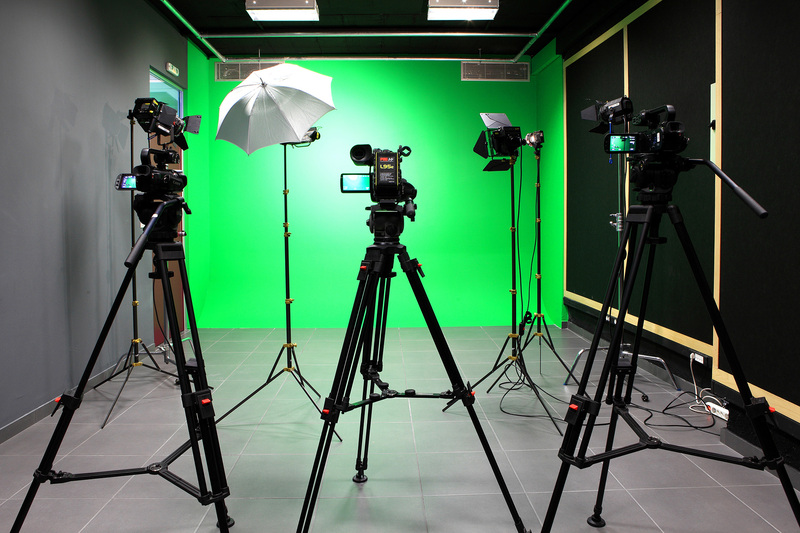 The final destinations on Level 2 is the Green Screen Studio and a storage room for audio & film equipment. 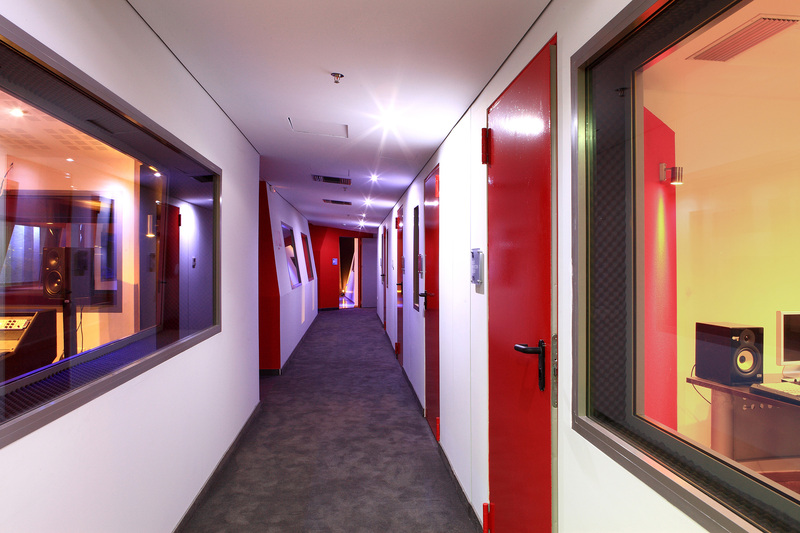 Level 2 (on the 4th floor), where all sound studios are housed, has been given the code name ʻThe Spacecraftʼ. And yes, truth is that the formation and the arrangement of the control & recording rooms, along with the lighting design, create the feeling of a spacecraft from the very first moment you get on board. 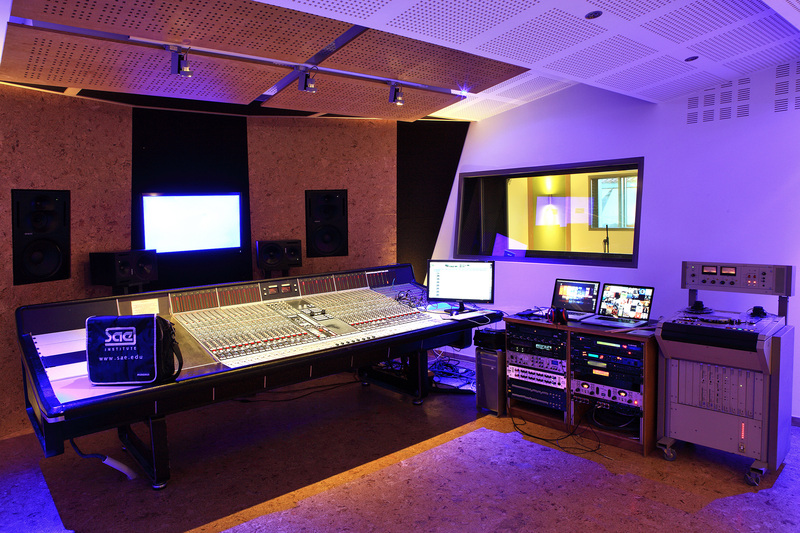 ʻThe Spacecraftʼ consists of four control rooms, four recording rooms providing digital and analogue technology in order to satisfy the students’ passion for all kinds of audio production and their need for practical training and creative experimentation as well. Level 2 also includes a DJ Booth where students gather in order to practice their DJ skills or to create mini-private parties, the audio academic coordination & management offices and a lounge area where students and guest musicians can relax. What makes ʻThe Spacecraftʼ even more remarkable is that it is the only multiplex of studios in Greece, housed four floors above the ground with great view and physical light provided by the surrounding windows. When you walk through ʻThe Spacecraftʼ and observe the students and their musicians working in every studio, you will definitely get the feeling that this floor is about to ʻtake offʼ. SAE Athens’s manager Chris Bikos and his staff, co-worked on the construction and design project with Sotiris Psarras (SAE Alumni, Director of Acou: acoustic engineering/constructions company), Lab Athens (dynamic architectural & design studio) and Apostolos Zafeiropoulos (top-notch graphic designer). The dedication, the vision and the experience of everyone involved in the relocation project, delivered a new state-of-the-art outcome. The new era of SAE Athens has just begun, higher levels have been set and the journey will, undoubtedly, be overwhelming, reaching endless educational destinations.